Home » Know Your Giants: DE Robert Ayers Jr.
Know Your Giants: DE Robert Ayers Jr. 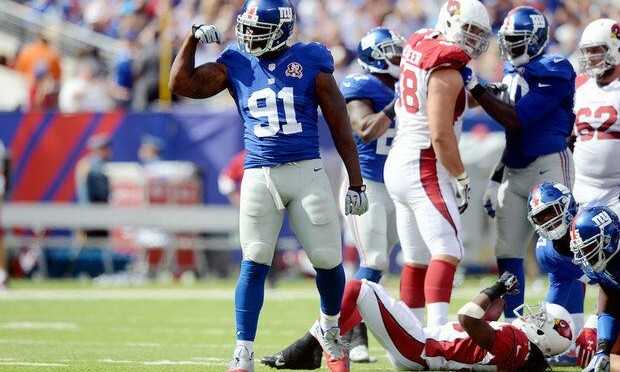 Defensive end Robert Ayers just completed his sixth NFL season and his first with the Giants. He spent the first 15 years of his life in New Jersey, a short distance from Giants Stadium, before moving to South Carolina. Ayers was second-team All-Southeastern Conference as a senior at the University of Tennessee in 2008. The following year, the Denver Broncos selected him with the 18th overall pick of the NFL Draft. Ayers played five years in Denver, and had an 11-yard sack of Tom Brady in the AFC Championship Game, helping to propel the Broncos to Super Bowl XLVIII, which they lost to Seattle in MetLife Stadium. Ayers signed with the Giants as a free agent on April 2, 2014. Q: Where did you live as a youngster? Q: What memories do you have of growing up in this area? Q: What did your parents do when you were growing up? Q: Did you have siblings? Q: Were sports a big part of your life when you lived here? Q: How did you do in school? Q: Since you weren’t really playing organized football, how did you play one year at Hoboken High School? Q: So you liked your first taste of organized football? Q: Who told you that you were going to move to South Carolina? Q: You moved there without your parents and siblings – that’s a big move for a 15-year-old. Q: Were you a defensive lineman at Marlboro County High School? Q: Did you get a little more serious about school when you got to South Carolina? Q: Do you have good memories of your time there? Q: When did the college recruiters start showing interest in you? Q: Did you seriously consider other places than Tennessee? Q: Did you talk to your parents regularly when you were in South Carolina? Q: Were you originally a linebacker at Tennessee? Q: Did you move to defensive end after your redshirt year? Q: It wasn’t until your senior year that you were a full-time starter. Was that frustrating? Q: Do you realize after that suspension that you couldn’t keep messing up like that? Q: You started as a senior. When did you think you might be able to play in the NFL? Q: The Broncos selected you 18th overall in the draft. Did you have any idea where you were going? Q: Why did you switch your jersey number from 56 to 91 after your second season? Q: Do you remember your first NFL sack? Q: David Garrard in Jacksonville. Q: Overall, were your years in Denver a good time in your life? Q: Did you know the Super Bowl was going to be your last game with the Broncos? Q: Aside from football, has it been fun for you to return to New Jersey? Q: A lot of free agents come here and they don’t like the traffic around here, but I guess it’s nothing to you because you grew up with it. Q: You’re one of the few guys that have played with both Peyton and Eli Manning. What is similar and what is different about them?